The simplest flow pattern through the tubes is for the fluid to enter at one end and exit at the other, this is a single pass bundle. This configuration is required when a temperature cross is experienced in the process. However, conditions generally do not make a single pass on the tube side a preferred choice. Increasing flow velocity and turbulence prevent formation of stagnant films of fluid on the tube surfaces. Thus, higher velocities improve the heat transfer rate. 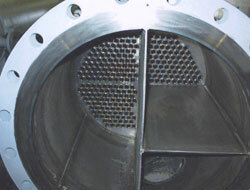 This means increasing the number of tube side passes - that is, directing the flow back and forth through the tubes in the bundle with partitions built into the heads of the exchanger. There are some limitations on how the different types of heat exchangers can be partitioned to provide various numbers of passes. With the “U”-tube exchanger, a single pass is not possible because the fluid must traverse the bundle at least twice. Any practical even number of the passes can be obtained by building partition plates in the front head. With the floating head pull-through bundle type, any practical even number of passes is possible. For single pass operation, however, a packed joint must be installed on the floating head. The fixed tubesheet type can be used for any practical number of passes, odd or even. For multi-pass arrangements, partitions are built into both heads.